A plane of perpetual renaissance, Fiora's beautiful cities are known across the Multiverse for their breathtaking architecture and the ingenuity of their inventors. 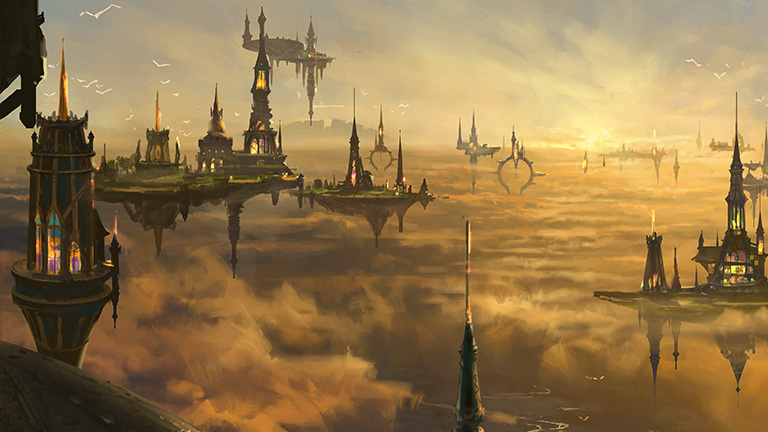 Despite its scenic vistas, Fiora is one of the most dangerous planes a Planeswalker can visit. Every sleeve hides a dagger, every smile a lie. In the capital of Fiora—Paliano, the High City—murder and subterfuge are common. Here, the fine print has fine print. Beneath the thin veil of civility, political factions and ruthless thugs vie for control of Paliano. Those who sit in the legislative seats of the High City control the vote, and the laws issued from Paliano mystically bind the populace. Planeswalkers travelling to Fiora should note that murder, manslaughter, and violence have never been outlawed—in fact, they are tools utilized by politicians on a regular basis. Outside of Paliano, the populace lives in smaller towns run by local government. Although they are not directly involved in the schemes of Paliano, the towns are still rife with corruption and back-alley dealings. The massacre of Drakestown is a grim reminder of this truth. Although far from the High City and bordering the wilderness, everyone was viciously murdered here years ago, their lives lost to an unknown scheme. The expansive wilderness also remains unexplored. The explorer Selvala was one of the first to travel the frontier, trying to find the world beyond the debauchery of nobles. Although the magic of the High City still dictates a citizen's actions, deep in the ancient forests, there is a promise of peace, for a reprieve from the backstabbing—and frontstabbing—of Fioran politics. Emissary Leovold is a recent arrival to Paliano, sent by his home city of Trest to secure their interests in the wake of Queen Marchesa's ascension. Leovold smiles at everyone, trusts no one, and plays all possible sides of the current crisis of succession in Paliano. The captain of the Guard, Adriana, is Marchesa's primary rival for the throne. She serves the Guard because the Guard serves the city, not the monarch, and she bears Brago's sword as a symbol of that authority. Adriana is popular throughout the city with gangs of citizen vigilante supporters who assist her forces in cleansing the city of corruption. Adriana has vowed on Brago's sword not to take the throne for herself, instead intending to install an interim government to rule until a suitable claimant is found. Marchesa's plan to seize the throne of Paliano spanned years and finally came to fruition at her arranged assassination of the ghost king Brago by Kaya's hand. Through bribery, intimidation, assassination, forgery, and other underhanded means, she then took the throne. Now she rules the High City of Paliano as queen, ruthlessly silencing those who oppose her. Her symbol, the Black Rose, now appears everywhere across the city as a sign of her influence. Brago once ruled the city of Paliano. After his untimely and mysterious death, the priesthood—or Custodi—knew that they would lose power through the succession. So they kept Brago’s spirit alive as a figurehead and were able to retain their command. Muzzio wishes to gain power so he can create his ultimate masterwork: a clockwork society comprised of an elite citizenry of scholars and mages overseeing an order of architectural perfection, and protected by an army of mechanized warriors. Once Grenzo ran quiet manipulations of Paliano as Dungeon Warden in the sewers below the city, but since Marchesa's bold rise to power, he has resorted to more overt tactics and begun a series of riots that are consuming the city in chaos. Whatever his motives, the results are chaos and looting that both Queen Marchesa and the city's Guard have been unable to bring under control. A longtime friend of Brago's, Selvala attempted to free him from the agony of his physical existence but instead transformed him into a ghostly political puppet of his Custodi advisors. Imprisoned for her crime, she was freed by the warden Grenzo in exchange for the murder of the artificer Muzzio, though she was able to escape and flee into exile. Recently Selvala has returned, consumed with outrage that her actions led to the enslavement of wild beasts in Paliano to replace the labors of Muzzio's cogwork creations. Kaya, a Planeswalker visitor to Fiora, has the ability to physically interact with the spirits of the dead. When an infamous assassin wanted Paliano's ghostly king destroyed, Kaya was more than happy to oblige...for a price. The goblin Planeswalker Daretti is a master artificer skilled at finding treasure where others see only trash. Daretti is a native of Fiora, and the spirit of inquisition and discovery pervades his scientific efforts. Adriana, captain of the guard, addresses the people of Paliano. Queen Marchesa addresses her subjects as she ascends to the throne. Adriana has begun to question the actions of her king, and it's clear from rumblings around the city that others share her doubts.